Is the Desktop Computer Doomed? "...thanks to Apple's 2005 shift to Intel chips, Windows 7 will become my main MacBook operating system. And if you hadn't guessed by now, after that my next computer will be a PC." InformationWeek's Serdar Yegulalp says that popular perception is that the rise of Web-based apps, virtualization, and a crop of powerful mobile devices have the traditional PC desktop on the run, thanks to cloud computing, Web apps, software as a service (SaaS), the "free desktop" (whatever that means - dk), and the rise of netbooks and tablet PCs. However, he suspects that the truth of the matter is more modest, and what looms for the desktop as we know it is not the end, but rather death and then transfiguration, with the desktop PC is set to go through a grand mutation of the form that will expand its reach rather than kill its current incarnation(s) outright. Link: Is the Desktop PC Doomed? "As much as I didn't want to believe it, my beloved 24" iMac that I use at work finally started having hard drive issues. I couldn't pinpoint if this was an OS X issue (firmware updated, etc.) or an actual hardware issue, but the internal hard drive started acting like it was going to sleep all the time, even though that option was turned off. I would be working and I could hear the drive spin down, and everything would hang. Then after a second or two, I could hear the drive spin back up and everything would pick back up. I figured this was as good an excuse as any to upgrade the drive and do a clean upgrade to Snow Leopard. I decided that, since I had a Drobo sitting next to me, I didn't need much internal storage, but given how much work I do on the machine every day, I wanted something fast. So the decision to use an SSD was a no brainer, specifically a 120 GB OCZ Summit drive..."
"Owners of Apple's new iMacs, including the pricier 27-in. model, have reported major performance problems with their machines, including extremely sluggish playback of Flash-based video, according to posts on Apple's support forum." "Others reported that the performance issue also affects some of the less-expensive 21.5-in. iMacs that Apple introduced Oct. 20." "Sometimes even the best educated guesses can be thrown for a loop when an unforeseen X-Factor comes into play. Such is the case with the Late 2009 iMacs. "As we were getting information together for the new iMac instructional videos, we came across a little tidbit that, apparently, hasn't been covered anywhere else: Apple has switched the iMac's method of hard drive temperature sensing. They've gone from an external sensor that attached to the outside surface of the drive to a connector that seems to use the drive's internal sensors. "On first blush, this would appear to be a good thing; an internal sensor is closer to the drive's mechanics and is likely to be more accurate regarding drive state. Unfortunately, there are no industry standards regarding the ports/pins used to access this information, and each hard drive manufacturer seems to do it their own way. And more unfortunately, when the iMac gets no sensor information via that cable, the heat exhaust fans kick into permanent high gear, so that cable must be connected. "That means, in order to upgrade the internal drive, you need to have a connector cable that's compatible with the brand of drive that you're installing & and that's an Apple service part not generally available to the end user. Pretty sneaky, Apple!" "The new iMacs, and similar all-in-one LCD desktop systems, make for a mostly cordless computing experience. Using two pieces of IKEA furniture meant for laptops and modems, you can hide the remaining wires and up the elegance." "If one considers only the design, the iMac 'luxo' is most likely the best model manufactured by Apple, with the Cube. Unfortunately, those models are aging, and sometimes stop working after years of operation. Nicolas found a interesting way to recycle his iMac: . "I was planning to reorganize my desk and I was looking for a lamp with an Apple-touch. So I decided to recycle my old iMac G4. With some spare parts, one can easily transform it into a nice lamp fully articulated thanks to the famous arm...."
Silicon's Seb Janacek says that after years of disappointment with Apple mice, one Mac lover has hope, noting: "I have a dream . . . a dream that Apple finally gets around to creating a really great mouse. A mouse to complement its rather splendid computers and even finer software . . . And now we have another shot at redemption. Will Apple's new Magic Mouse end its losing streak at creating great computer mouses? . . . Yes and no." Link: Magic Mouse - Apple's Best Ever? "I'm a multitouch junkie. Everything I touch has to be multitouch, or it just ain't right. I can no longer use a regular laptop trackpad - there's no two-finger scrolling. It irritates me no end if I can't point, scroll and double-click with my fingers. "How long will it take then, to get used to the Apple's new Magic Mouse? So far, it's been frustrating. It seems like the Magic Mouse would be perfectly natural to use, but it isn't." "Apple has broken its decade-long chain of terrible mouse designs with the new multitouch, wireless Magic Mouse, although its multitouch features are somewhat limited in functionality. "If previous versions of Apple's Bluetooth wireless mice and the sticky trackball of the Mighty Mouse have left you skeptical of the company's ability to design a desirable mouse, you may be in for a surprise with the new Magic Mouse." "If you are having issues with your Bluetooth mouse, keyboard or BT in general on Mac OS X Snow Leopard, I recommend downloading and installing the just-released software for the new Apple Magic Mouse. "Yesterday, when I saw that piece of software posted on the Internet, its size perked my interest checking in at 64 MB compressed and 149 MB uncompressed for the Snow Leopard version. At that size, this software update must contain more than a mouse driver. "Not only does my Microsoft BT mouse now function completely correct, but Bluetooth in general is also working better for me. Way to go Apple, fixing your errors and not admitting a thing at the same time typical Apple. But, I am fine with that, as long as my stuff works!" Link: New Apple Magic Mouse Software Fixes Issues with Older Bluetooth Devices? "Two Mac mini updates in seven months? Forgotten Mac, indeed," says Macworld's Dan Frakes, noting that the Mac mini received a long-overdue refresh earlier this year after 19 months since the last revision, and now there's another, offering comparatively minor improvements at the same price points, and as well as the new Mac mini models, Apple has released a Mac mini server which Macworld will be reviewing separately. "Apple recently updated its popular iMac line of desktop computers to include larger screens, more standard memory and bigger hard drives. Three of the four new configurations two 21.5-inch models and one 27-inch model feature 3.06 GHz Core 2 Duo processors and are available now. Macworld Lab has the 3.06 GHz trio and we've put them to the test...."
"The Tables below show the major specifications and features for Apple Mac minis. Different configurations for the minis are based on Apple's Online Store. Vendors' configurations may vary." PR: The Cirque Easy Cat touchpad makes it easier and more comfortable than ever to control your computer. To perform basic mouse functions, simply glide your finger over the smooth surface to point, then tap on the pad or press on the buttons to click or activate vertical scroll by simply gliding a finger along the right edge of the touchpad. Use an Easy Cat, instead of a traditional mouse and your wrists will thank you. Easy Cat's compact size makes it a perfect traveling companion for your laptop. GlidePoint Technology - Cirque's capacitive touch technology provides complete navigation control of any graphical interface, packed in a space-saving, low-friction, durable mouse alternative. GlidePoint's sophisticated sensor system quickly responds to precise finger movements. The Cirque Smart Cat adds comfort plus performance to computer control with an extra-large touch surface, intelligent software, one-touch scroll and zoom, and distinctive sounds for each operation. Basic mouse functions are a snap. Simply access right-clicks by tapping a finger in the touchpad's upper right corner, and quickly activate vertical/horizontal scrolling as well as magnification tools by gliding a finger along the touchpad edges. The Smart Cat Pro combines all the power of a top-of-the-line mouse with the unrivaled comfort and durability of a touchpad with intelligent software, one-touch scroll and zoom, and distinctive sounds for each operation. Additionally, four unique, programmable hotlinks independently execute programs/commands, open files, control browser functions, assign (toggle) mouse actions and control cursor modes. The Cirque Trackpads do not ship with software of their own, and basic trackpad functions are supported by the Mac OS without additional drivers. However, some of the trackpad's advanced features that are supported on Windows PCs are disabled on Mac installations. However, there is a partial workaround. A shareware device driver software called USB Overdrive created by Alessandro Levi Montalcini is recommended (although not supported) by Cirque for users who wish to configure the Easy Cat Trackpad's button clicks. USB Overdrive enables button reprogramming, submenu launching vertical scrolling and more. USB Overdrive 3.0.1 works in Mac OS X 10.4 (Tiger), 10.5 (Leopard), and 10.6 (Snow Leopard) in both 32-bit and 64-bit modes. OS X provides the following features without third party driver installation. Easy Cat functions as a standard USB compliant 2-button mouse. GlideExtend - Continued movement when the edge of the touchpad is reached by lifting and repositioning the finger to continue motion. "Control-click" functionality with the right button and the corner tap zone. Note: Cirque does not provide drivers for the Macintosh platform. 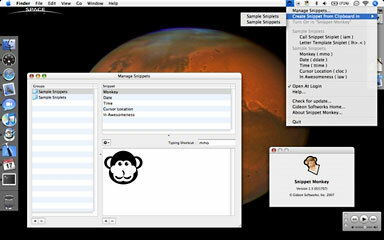 Users that wish to customize their input devices on the Mac platform may find the USB Overdrive shareware utility allows for more customization of the touchpad features. Several Cirque touchpads in Low End Mac's Amazon.com Store. Free shipping on orders over $25. 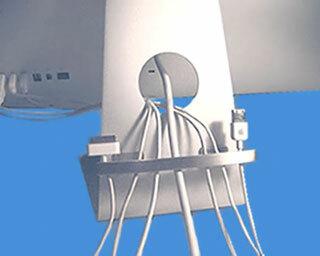 PR: newPCgadgets.com introduces The Rail a new cable management product for the iMac. The Rail is a stylish cable organizer designed to match the look of your iMac. Designed from polished steel, The Rail attaches directly below the center slot on the iMac pedestal. The Rail holds up to 8 small cables in the stainless steel wire clips. Larger cables like the power cord are held in the center section. Easily stores cables for future use and fast access on the sides. Excess wires can be wrapped around the posts. The Rail is available for $24.95. PR: Ideal for scrapbookers, serious and casual photographers, and budding graphic artists alike, Photoshop Elements 8 for Mac is more powerful and easier to use than previous versions. But figuring out how and when to use the program's tools is still tricky. With Photoshop Elements 8 for Mac: The Missing Manual (O'Reilly, $44.99) by Barbara Brundage, you'll learn what each tool does, as well as when it makes the most sense to use it and why. You get easy-to-follow, step-by-step instructions for everything from importing photos to organizing, editing, sharing, and storing your images. You'll also find a tour of Bridge, the ultra-deluxe file browser that comes with Photoshop CS4 - and Elements 8. "As someone who's primarily a Mac person, I'm really thrilled that Adobe is bringing out the Mac version of Elements 8 at the same time as the Windows version," notes Barbara Brundage. "It was really great not having to wait several months to write the Mac version of the book!" With this fully revised, best-selling guide from author Barbara Brundage, you'll quickly be using Elements instead of spending hours trying to learn how it works. From gentle introduction to more advanced tips, this book is your go-to guide. Order books from the Missing Manual library through Low End Mac's Amazon.com Store. Free shipping on orders over $25. PR: Pining for Blue-ray support on your Mac? Other World Computing (OWC) has announced that its Mercury Pro Blu-ray External Drive is the first "Quad Interface" 12x Blu-ray disc burner on the market. With the flexibility of a "Quad Interface" of FireWire 800, FireWire 400, USB 2.0, & eSATA interfaces, the OWC Mercury Pro External Drive line offers Plug & Play disc burning compatibility with both Windows and Macintosh systems starting at $299.99. OWC Mercury Pro Blu-ray Reader/Writer solutions include two 25 GB BD-R discs, connecting cables for all four interfaces, and are backed by a one year OWC Warranty. Available immediately, the Mercury Pro Blu-ray External Drives are capable of burning up to 50 GB of data - equal to 50,000 JPEG images, 17,500 MP3 songs, 25 DVD quality movies, or just under four hours of High Definition video - onto a single Blu-ray disc in 15 to 20 minutes, the Mercury Pro Blu-ray drives also read and/or write virtually all types of optical media, including DVD R/RW & Dual-Layer, DVD-RAM, and CD-R/RW. A $129.99 retail value, Toast 10 Titanium Pro is included with two OWC Mercury Pro Blu-ray External Drives bundles for Mac users. A long time Mac favorite tool for burning CDs and DVDs, Toast 10 Titanium Pro takes burning on Macs to the next level with built-in Blu-ray data and video disc burning capabilities, in addition to DVD & CD support. Ideal for creative professionals and designers, as well as home photo and video hobbyists, Toast 10 Titanium Pro supports the burning of massive amounts of raw data files, as well as the creation of fully playable Blu-ray video discs. Using this included software, Mac users can convert and burn a wide variety of QuickTime compatible files and HD video footage from AVCHD camcorders, TiVo DVRs, ElGato's EyeTV, etc. and then play the discs on any standard Blu-ray set-top box or PS3 game console. "By providing the double benefit of the fastest Blu-ray burn speeds in the only 'Quad-Interface' external drive, the OWC Mercury Pro Blu-ray drives give Mac and PC users the high performance they need to burn large amounts of data to Blu-ray discs quickly and easily," said Larry O'Connor, CEO, Other World Computing. "Mac users seeking the easiest, most complete drag and drop video to Blu-ray disk burning solution on the market cannot find a better value than our special Toast 10 bundles." 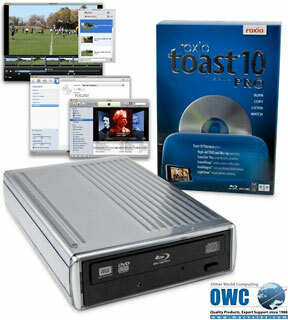 The OWC Mercury Pro Blu-ray "Quad Interface" External Drive line has been fully tested for compatibility with most Mac and Windows built-in and third party DVD/CD tools and players, including Apple iTunes, Apple Disc Burning, Apple iLife Suite, Apple Final Cut Studio 2 (exporting edited video to Toast for Blu-ray mastering), EMC Retrospect Express, NTI DragonBurn, Roxio Toast, Roxio Easy Media Creator, and Nero Burning. PR: Parallels have announced the availability of the fastest, most seamless Windows-on-Mac solution ever: Parallels Desktop 5 for Mac. This is the latest version of the #1 Mac system utility, currently enabling more than 2 million users to run Windows, Linux, and other operating systems side-by-side with Mac OS X. According to performance research conducted by Crimson Consulting Group, Parallels Desktop 5 for Mac performs 22% faster than the nearest Windows-on-Mac competitor in standard productivity testing of Windows 7 64-bit on a MacBook Pro. In addition, version 5 is up to 300% faster for virtual machine operations than the previous version. For 3D and graphics performance, tested under the industry standard 3Dmark 2006 Professional test suite the new version performs up to 7 times better. Users can test this for themselves with a free trial. "As the OS battles rage between Microsoft, Apple and Linux, we provide a completely customizable solution that enables people to use the applications they need with the fastest performance available, regardless of the operating system," said Serguei Beloussov, CEO of Parallels. "Parallels continues to build on its proven track record of innovation, responding to our customers by providing the fastest, smartest and most powerful Windows-on-Mac experience available." There are more than 70 new features in Parallels Desktop 5 for Mac, many of which give users the flexibility to work in the way they want. Users can choose how much or little Windows they want to see, from running Windows in Full Screen mode where Windows completely covers the Mac user interface to the new Crystal view mode which makes Windows completely disappear. Users can even get a Mac-like experience in their Windows applications, using the intuitive Apple Trackpad Gestures technology to pinch, swipe, and rotate as they do in Mac applications. "Ideally PC emulation should be transparent and invisible, and Parallels Desktop 5 for Mac goes a very long way towards this," said beta tester and executive in the mining industry Nic Clift. " The thing that strikes me most about Parallels Desktop for Mac is that it is trouble-free, consistent with what I expect of Mac software, and has proved to be a remarkably convenient and easy way for me to maintain as much access to the world of Windows as I want. Parallels works as neatly with Boot Camp as it does when running seamlessly in the background, along with my everyday Mac software. If anything, version 5 has made Windows emulation even more transparent and trouble-free and unless one wants to get involved with the details of setup it is easy to forget that it is even running." "The excellent 3D graphics performance of Parallels Desktop for Mac makes it Autodesk's preferred Mac virtualization software for customers who choose to run AutoCAD or our other design and engineering software on the Mac," said Andrew Mackles, Director of AutoCAD Product Management at Autodesk. "We are excited about the further graphics enhancements in Parallels Desktop 5 for Mac and the potential to improve the customer experiences." Parallels Desktop 5 for Mac is available in English, German, French, Italian and Spanish starting today - Additional localized versions will soon be available in Chinese, Czech, Hungarian, Japanese, Polish and Russian in the coming weeks. The standard retail price (SRP) of Parallels Desktop 5 for Mac is $79.99, including $175 worth of additional software for free: Parallels Internet Security 2009 by Kaspersky (1 year subscription); Acronis Disk Director Suite 10.0 (Disk Management); Acronis True Image 11 Home (Backup and Recovery Solutions). Current Parallels Desktop users can upgrade their existing software for $49.99. Users that purchased version 4.0 on or after October 1, 2009 qualify with a proof of purchase for a free upgrade to version 5. Customers who purchased from the Parallels Online Store will be notified directly with their upgrade key. Customers who purchased Parallels Desktop 4.0 for Mac with Channel/Retail/e-tail Partners have to proactively claim their free of charge upgrade. Parallels Desktop 5 for Mac is available starting today at the Apple Store, Amazon.com, Best Buy, Fry's Electronics, MacMall, MicroCenter, Target, and hundreds of other retail locations nationwide. Volume pricing and site-license opportunities are also available for new customers by contacting the Parallels Sales Team at sales@parallels.com or 425-282-6400. PR: ClipMenu 0.4.1 is a clipboard manager for Mac OS X. To paste a recorded item, you just pop up menu by invoking the shortcut key, and select a menu item from the menu. You can also register texts you frequently use, like e-mail addresses, user IDs and so on, as snippets. You can paste these snippets from the menu, too. Fixes a bug that causes force pasting regardless of the preference. 64-bit support in Mac OS X 10.6 (Snow Leopard). Add autosave function to save clipboard history periodically. Automatic update support using Sparkle Framework. Add a dialog to ask you whether enable/disable "Launch on Login" option. Add an option to enable/disable reordering history when clipboard data is changed. Append the application's version number to a tooltip on the status menu bar icon. Change default keyboard shortcut keys (Cmd-Shift-V, Cmd-Shift-B). Change folder icon when mouse over a folder menu item in a menu. Make status bar icon selectable. Add new status bar icons (by Dave Ulrich). Change the label of "Quit" menu item to "Quit ClipMenu". Add a suppression button to the dialog window to ask whether show it or not. Fix a glitch occurred when max history size is decreased. Fix an issue with preferences panel. Mac OS X 10.5 (Leopard) or later. 64-bit support in Mac OS X 10.6 (Snow Leopard) or later. PR: Snippet Monkey saves you countless hours monkeying around by allowing you to create shortcuts for phrases you frequently type. We call the phrases snippets and Snippet Monkey allows you to create new snippets from the clipboard or via our easy to use snippet editor. System Requirements: Mac OS X 10.6 or later. Mac Users: We're Sorry, It's Coming! 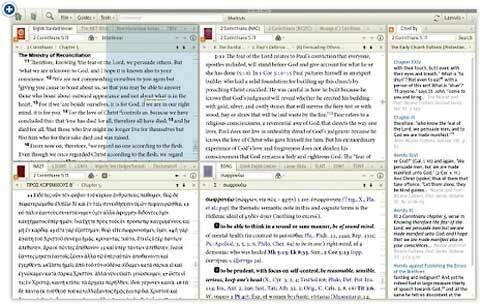 Logos Bible Software 4 is dual platform, but the Mac version is not finished. We are presently shipping a prerelease Alpha of the Mac version. The Alpha for Mac shares the same underlying code as the Windows version, but is missing much of the user interface, which needs to be coded specifically for the Mac. The Alpha can update itself over the Internet. We plan to release an update every two weeks or so, which it detects and downloads automatically when it is run. If you order Logos Bible Software 4 today, you will receive one disc that installs the Mac Alpha on Macs, and the Windows version on Windows. You can install on either Mac or Windows or on both. Any data you create in either version - Mac or Windows - will be automatically synchronized over the Internet. You can choose to run the Windows version now, and know that your data, notes, and settings will transfer to the Mac version when it is complete, or you can choose to run the prerelease Alpha version on the Mac. Or both. If you are already a Logos Bible Software for Mac user, upgrading to Logos Bible Software 4 will not change your existing installation. You can run the older product side-by-side with the Alpha for Mac. If you are not an existing user, but need a stable Mac version right now, you can purchase Logos Bible Software 4 now and install it on either Mac or Windows. We will soon make available a free download of the old Mac product with instructions on how to activate it to use the larger set of licenses that come with Logos Bible Software 4 base packages. This is a bit of a hassle, for which we apologize. 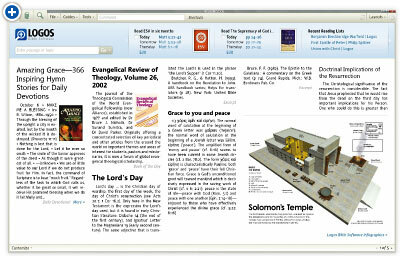 Logos Bible Software 4 is a completely new product. We started over so that we could take advantage of the latest technology for both Windows and the Mac, and because we wanted to do things right. The first version of Logos for Mac was started long ago using our last generation design. It took too long, and was still being developed (by an outside partner) as we worked on new platform development for Windows. We had to choose between continuing that effort and having a Mac product that remained a generation behind, or starting a new Mac project that shares code and matches--or exceeds!--the Windows product feature-for-feature, complete with synchronization of all your data. It was an easy choice, but a hard pill to swallow in regards to timing, because it reset Mac development to the starting line just after we'd shipped our first version. The good news is that we're moving forward as a multiplatform product. Logos Bible Software 4 is not even sold for Mac or Windows; we have both a Mac and a Windows version on every disc. (And iPhone support as well!) We don't have different pricing. You don't have to specify Mac or Windows when ordering. Our goal is that Logos Bible Software 4 just works--for Mac and Windows. The Mac version is not finished yet, though. We have the core of the system working on both platforms, and the Mac Alpha release reads and indexes the exact same resources and data files as the Windows version. It synchronizes with the server and even uploads and downloads notes, settings, and other data. It can automatically update itself over the Internet. It just needs work at the user interface level, and we're doing that as fast as we can. Why didn't we wait? Because the Windows and iPhone versions were both ready, and because the new collections have so much value in them we didn't want to delay offering them to our users. Delaying wouldn't speed up the Mac product, it would just delay access for the larger group of users. Windows users are still the majority of our customers, but we're seeing an incredible move to the Mac. That's why we've developed a common code base and a unified product. And our powerful synchronization system accommodates those poor souls forced to use Windows at work when they have a Mac at home as well as making it easy for switchers to jump. You'll be able to make Bible study, not your platform, a priority, and switch easily from Windows to Mac to iPhone (to web!) without losing a thing. We're so sorry to be late with the Mac version again, but we know you're going to love the result, and we want you to know that the Mac is a top-priority. Please Note: You may purchase Logos Bible Software 4 for Mac Alpha right now, and use it on Mac or Windows, but there will be no technical support for the Mac version until it becomes a final release. Every two weeks or so, it will automatically download an update, and keep getting better all the time. If you aren't comfortable with an Alpha release you should probably wait until it is a final release and support is available.